WILL MEN LET THE LADIES VOTE? It was good news, bad news for California women in 1911: There would finally be a vote on changing the state constitution so they would no longer be second-class citizens. The bad news was that the suffrage movement had eight months to convince male voters that allowing women these basic rights was not a radical thing. It would be an uphill battle all the way; only three other states had given women full suffrage, and those were in much smaller states and their campaigns had been ramping up for years. In 1911 broadcast media did not yet exist and state roads were still little more than unpaved wagon trails, so simply reaching voters would be an accomplishment itself. And opposing them was a well-funded, national coalition of social conservatives, the liquor industry – which feared women would vote in prohibition – and old-timers (male and female alike) who plainly didn’t like uppity women. Not since the Civil War had California been so divided on an issue. Some newspapers remained neutral, but they were few; it was more about how strongly the paper was “for” or “anti.” The most supportive daily was the San Francisco Call and the most hostile was the Los Angeles Times. Within their pages, war raged daily. When it finally passed the California legislature, “Constitutional Amendment No. 8” did not mention women at all. It only stated “every native citizen of the United States” who was over 21 and a citizen could vote. It specified instead who could not cast a ballot: “No native of China, no idiot, no insane person, no person convicted of any infamous crime, no person hereafter convicted of the embezzlement or misappropriation of public money, and no person who shall not be able to read the Constitution in the English language and write his or her name.” That pesky “educational qualification” didn’t apply to current voters, of course, or anyone with some physical disability that kept him from being able to write or read, or anyone sixty years or older. With that established, the race to the voting booth was on. To the dismay of suffragists, former president Teddy Roosevelt didn’t help, giving a speech a month later at the UC/Berkeley Greek Theater where he remarked, “Personally I’m very tepidly in favor of woman suffrage, but it seems to me it is infinitely less important than innumerable other questions which are worthy of our thought and effort.” This was a painful reminder to the public about the hissing flapdoodle a few months earlier, when President Taft told a convention of suffragists it could be dangerous to allow women to vote and then dressed down the audience when someone hissed at the condescending remark. Once the special election was approved by the legislature, Deering quickly appointed a press manager in every county to pepper the editors with local news as well as reporting back to her about local coverage. (There was only a single county where she could not claim a foothold – she identified it only as “a very remote, sparsely populated mountain county” – but in the end it voted for suffrage, anyway.) Deering mentioned specifically seven women she relied upon, including Frances Martin. But at the top of Deering’s list of effective county chairmen was Sarah Latimer Finley, whose son, Ernest, happened to be editor and publisher of the Santa Rosa Press Democrat. Ernest Finley seemed an unlikely champion of women’s rights. As discussed here earlier, he was virulently opposed to the progressive movement of the day, using the PD to denounce those who wanted reforms in Santa Rosa as agitators stirring up “hard feelings” in town using “cowardly and un-American” tactics.” Now, the paper was praising those same progressives because they were speaking out for suffrage. Finley had attacked civic groups seeking to rid the town of its underground economy based on gambling and prostitution, charging they were secretly prohibitionists who wanted to turn the county “dry.” Now, he was aligned with a cause strongly supported the temperance movement. But whether Ernest Finley was stirred by filial devotion or a sudden bout of ethics, Mrs. Finley’s suffrage columns were featured in the PD, and pro-suffrage letters began appearing regularly in both Santa Rosa papers; a typical example is excerpted below, written by William Keith, a Berkeley landscape architect and husband of a veteran leader of the movement. To the dismay of Wall and the others, they found a portion of the audiences were so anti-suffrage that their satirical arguments against women’s rights were applauded and not considered absurd at all. “From that hour the Blue Liner was dedicated to ‘straight talk,'” she wrote. 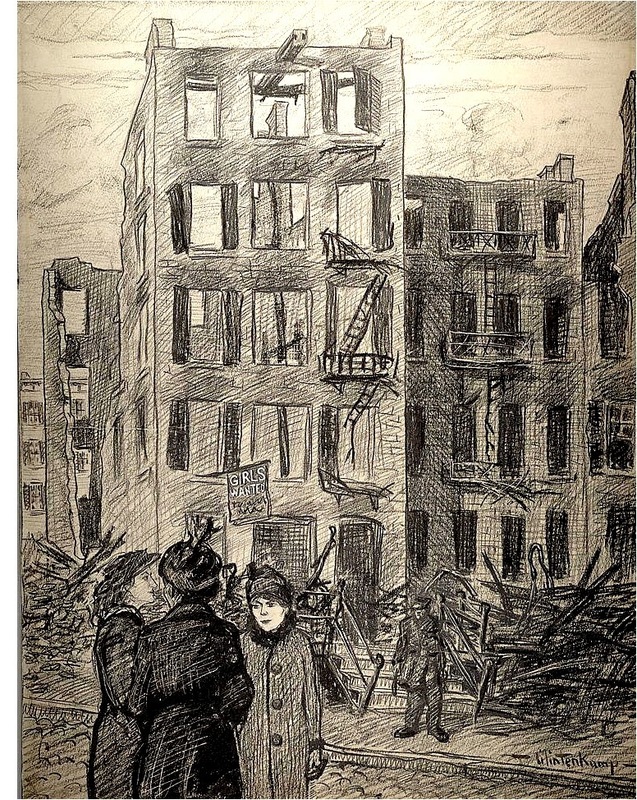 And while it’s horrible to contemplate, it has to be recognized that the California suffrage campaign received a boost from the Triangle Shirtwaist Factory Fire, which occurred in New York City just as the Deering’s publicity machine was shifting to higher gears. There were 146 young women killed in that sweatshop tragedy, most of them teenagers, working in a ten story firetrap when a careless cigarette ignited a pile of cuttings; in the fast-moving fire they found themselves trapped with doors locked (to prevent pilfering) and other exits useless because the doors only opened inward. Many jumped to their deaths. Details of the Triangle fire unrolled in newspapers nationwide over the course of several days like a serialized horror story. It was reported instead of jumping, some were pushed out of the windows by the press of panicked women behind them; dismembered bodies were found closest to the exit doors; 50 people crowded into the single working elevator meant to carry no more than a dozen. Most terrible of all was the account of a a United Press reporter who happened to be on the scene: “I saw every feature of the tragedy visible from outside the building. I learned a new sound–a more horrible sound than description can picture. It was the thud of a speeding, living body on a stone sidewalk.” And that is one of the least nightmarish passages in his report. Not everything that appeared in print was true, but you can bet every new horrific detail was being chewed over in every saloon, every fraternal clubroom, every parlor. The Triangle fire was the antidote to claims by obstructionists such as Senator Sanford. It was hard to still argue “men could be counted upon to protect women” when even the weak safety laws weren’t being enforced. It also put the public’s focus on working women which helped dispel the sentimental, lace-bordered fantasy of every woman (well, every good woman) being a domestic goddess and mother; women also worked hard jobs and sometimes died in the workplace – in the fire the Maltese family, for example, lost their mother and two daughters, including a 14 year-old. And finally, it deflected attention from the concern that once suffrage passed, women would likely vote for prohibition laws. Newspapers reflected the public’s outrage mostly through editorial cartoons, but the angriest – and most eloquent – op/ed to be found anywhere appeared in the Press Democrat (and apparently, only in the PD). Most often identifying the victims as girls, the writer bitterly remarked, “this is a free country, and it has women to burn.” If the impoverished young women didn’t want to work in dangerous conditions they could quit like any other worker, because under the law, “all are equal.” The editorial was unsigned, but dripped with the irony that flowed from the righteous pen of one Frances McG. Martin. The frightful catastrophe in New York less than two weeks ago was even more frightful than was told by the telegraphic news. The most outrageous feature, as told by the New York papers, was that of the causes of the tragedy wherein 150 women and girls were roasted to death or smothered in smoke, or dashed to pieces on the pavement. The sacrifice was caused by oppression, greed and tyranny– by inadequate laws for protection of the poor; by rich men’s defiance of the law and by compliance of weak officials when rich men deemed it inexpedient to observe the law. That towering building, ten stories tall and crowded with 2,000 working women, had previously been on fire six times within twelve months. Each fire was a warning and a prophecy of the terrible disaster that was to come. That is not the full measure of the of the iniquity. To make sure that none of these girls could steal a yard of cloth [illegible microfilm] the Triangle Shirtwaist Company locked them behind an iron-barred door at the foot of a narrow stairway, and each evening when their work was done the company had them subjected to personal search–such search as policemen subject a sneak-thief to when they take him to jail. This door opened inward when opened at all and could not be opened when the door keeper fled with the key. When the lock was broken the door could not be opened because of the pile of dead bodies that weighed against it–about 80 girls piled on top one another. When the girls went on strike because of the closed doors and the lack of sanitary appliances and the lack of fire escapes, the Triangle Shirtwaist Company’s directors did not miss a meal. They calmly waited for starvation to drive the girls back again. They broke the strike, and the girls, driven by poverty and hunger, went back to work, those of them who could get back. Those who could not get back, went on the streets or went to work in other places probably equally dangerous. Fire Chief Croker say there are scores of them in New York City. Not many weeks ago twenty girls went to death in the same way in the same sort of building in New Jersey. The girls had their choice. They could either go to work in such places, or they could starve, or they could go on the streets. This is a free country, and it has women to burn. There is the brutal essence of the industrial condition that “protect” a factory-owner’s profits with a benevolent tariff, but deny protection to the lives of young women who toil and moil to earn their bread, and to make dividends for the mill-owners. Most of the girls in those factories work for starvation wages. Some of them who were killed in New York were earning only $3.50 a week, and only 22 among 2,000 wer earning as much as $18 a week apiece. “O, men with sisters, dear! O, men with mothers and wives! At the meeting of the Woman’s Suffrage League, held Saturday in Judge Emmet Seawell’s court room, there was a large attendance of the ladies interested in the movement. Attorney F. McG. Martin made a splendid opening address and resided at the meeting. In her address she took up the suffrage movement point by point and explained them. Rev. C. Augustus Turner, formerly of New Zealand, made the principal address of the afternoon and gave his audience a talented presentation of the question. …A great many say, “But the women will not vote, if they should be given the right.” The best women will vote, however, for when a duty is imposed upon a good woman, she never shirks her responsibility. On an average, about twenty per cent of the men do not vote, but is that any argument for disfranchising all men? Count me on the right side of the woman suffrage question. – William Keith. Mrs. Mabel Craft Deering, who as Mabel Craft was widely known as one of California’s brightest writers, has been chosen State Press Correspondent of the Woman’s Suffrage movement. Mrs. Deering has returned to California and is now in San Francisco, where she will take active interest in the coming campaign. Attorney Frances McG. Martin, President of the Santa Rosa Political Equality Association, has received word from Mrs. Deering regarding her acceptance of the appointment as State Press Correspondent. Mrs. W. A. Finley of this city has been asked to act as County Press Chairman and has accepted the position.